Trading in bonds is quite different to trading other markets such as Forex or Stocks. For first timers to bonds trading it can be intimidating to say the least as the terminology used in bonds investing is also different and includes references to the economy and math as well. In this article, we point out some bond market trading tips to bear in mind. For a primer on investing in bonds read this article. Bonds trading is not as complex as it seems. Of course terminology such as fixed income securities, debt instruments and so on are nothing more than an IOU differing slightly in terms of the returns they give and the maturity dates and the rate of interest. Investing in bonds is considered to be a safe investment. However, bonds are not immune to risk. The main aspect where bonds differ from rest of the markets include inflation and liquidity risks. Bond markets tend to move in the opposite direction to interest rate changes. In other words, higher the interest rates, lower the bonds and vice versa. Buying a bond and holding it until maturity means that fluctuations in interest rates won’t really matter in the interim. However, if you plan to sell the bonds before maturity the price you could get will be directly in relation to the prevailing interest rates. Bonds are sold by governments, government sponsored agencies such as municipal bonds as well as sold by public corporations. Bonds in itself come in different variations, the most common being the short term 10 year bonds to the long term 30 year maturity periods. Bonds usually fall into either of the three categories. The extremely safe bonds are issued by the governments and its corresponding agencies. Safe bonds are usually sold by corporations, city and states. These two types of bonds make up the “investment grade” bonds. The third category of bonds, classified as “risky” are bonds sold by the same institutions and are often referred to as junk bonds or below investment grade bonds. Bonds are usually graded by credit rating agencies such as Moody’s, Fitch, Standard and Poors which publish regular reports on the investment grades on the debt issues. Read more on how ratings agencies impact the economy. One of the key factors in trading bonds is “yield” or a “yield curve”. The yield curve represents the relationship between the rate of interest the bond pays and when it matures. Educative comparisons can be made by understanding how to read the yield curves and the spreads. Some bonds offer tax free returns, especially the ones issued by cities, municipal bonds which are aimed at raising cash for public sector spending. The interest payment on such type of bonds are usually free of tax. However, such bonds are not available for everyone. The bond markets usually form the basis for other markets such as bond futures and options. There are also different deriviate investments available as well, the most common of these being “credit default swaps” that are a form of insurance to protect investors against defaults. How can you trade bonds? Bonds can be traded as CFD’s offered by Markets.com and as Futures (CME Futures). 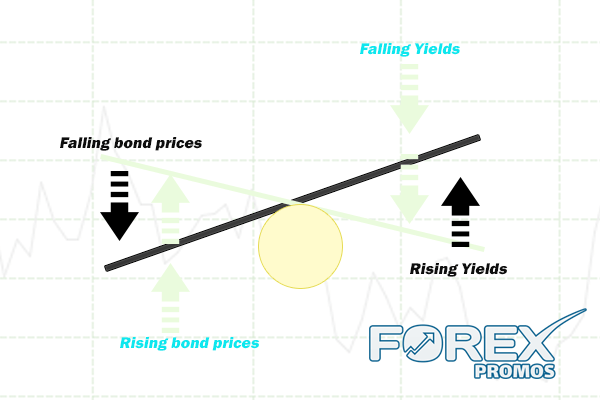 Remember that when you trade bonds, you are trading the bond prices (which work inversely to yield) therefore, when you expect rates to go up you would be selling bonds and vice-versa. The chart below shows an overlay of the CME Futures, 30-day Fed funds rate. On the right is the price and on the left is the yield. When trading in the bond markets, small investors are usually vulnerable as trading in bonds requires a lot of research. Trading in bonds is also available via the “Over-the-counter” trading as well with retail forex brokers offering a good selection of bonds to trade with. PrevMetaTrader 5 App: What Does It Offer?